First – what do we mean by complex? Well, you have to be amused that defining complexity turns out to be, well, complex…. In such circumstances, it often turns out to be best to go with our intuitions of what we mean, and allow instances and illustrations to clarify our meaning. It’s a method that works for all sorts of important ideas, like what it means to love, or be a dad, or…. And then what do we mean by emergence? Economist Jeffrey Goldstein defined emergence as: “the arising of novel and coherent structures, patterns and properties during the process of self-organization in complex systems”. That’s a bit tricky, because it manages to use the terms emergence, complex, and self-organisation all in the same knot. A key thing to note is that in environments of complexity, emergence is inexorable (it happens relentlessly whether we want it to or not), but not necessarily desirable. Is a big wave a complex phenomenon with emergent features? (3) No doubt that could start an argument. But what there is no doubt about is that the place to be as it unfolds is riding it, not under it… This is the capability provided by conversation in emergent environments. b) that therefore they will exhibit this weird and (not necessarily) wonderful phenomenon of emergence. For conversation to be any use to us in such a world, we have to be able to propose a mechanism for conversation to have an effect. It turns out that it does. Of course, not everything that goes under the name of planning is up to the challenge of coordinating us in conversation. 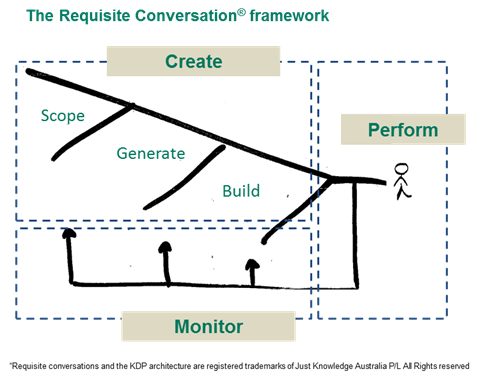 So conversations, demonstrably in the form of “planning conversations”, and in fact in other significant forms too, are what enable us to become the big wave surfers of enterprise. (2) This different kind of order is usually referred to as a “higher level”, but I’m not sure what the reference point is for that comparator. (3) Photograph by Shalom Jacobovitz http://commons.wikimedia.org/wiki/File:2010_mavericks_competition.jpg. The big wave surfing metaphor is worth keeping in mind. Being on top of the wave is better than being under it, and conversations make it more likely that you can ride complexity. But there are no guarantees. 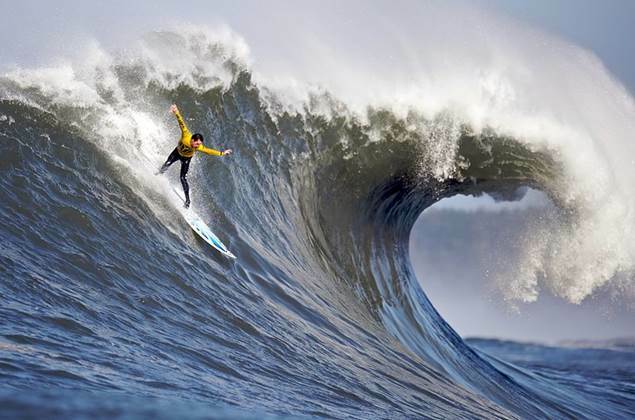 Mark Foo (December 23, 1994), and Sion Milosky (March 16, 2011) died surfing this wave at Mavericks. (9) James W. Begun, Brenda Zimmerman, Kevin Dooley, 2002 Health Care Organizations as Complex Adaptive Systems. Revised version in S. S. Mick and M. E. Wyttenbach (eds. ), Advances in Health Care Organization Theory (San Francisco: Jossey-Bass, 2003). Changing the ways people talk to get work done. New work? New conversation! Change Conversation. Naming is not only deeply personal to ourselves – to OUR own name. Naming is our way of making knowledge personal. This is not to say that we make up our own private language, as lovers might do with personal endearments. It is to say that “naming” is the way we create order in the conversational cognition of meaning making, as distinct from that of labelling. Naming is the distinctive conversation based activity (regardless of whether that conversation is audible or inaudible, interpersonal or just plain thinking) that carries the sense we have made, and are making, of our world. Of course we need to have shared labels for things. This is the basis of “coordinating our coordinations” (Maturana). That is, I can coordinate myself enough to have a drink. But if I want to coordinate that capability with your capability to do the same – so that we end up having a drink together at the pub – we need to “coordinate our coordinations” – our biologically functioning needs to be aligned by the language we use. What is personal to me is the mental model formations, attributions of meaning and value, associations and memories, all of which guide my reactions and interactions. These are far from stable labels, precise attributions that are only as broad as the number of lenses in the vertical array of the trilobite species eye…. (Richard Fortey: Dry Store Room #1 p77). On the contrary, they have a diversity, flexibility , breadth and looseness that lets me proceed somewhat peaceably – or at least largely without psychopathology – in the the “blooming, buzzing confusion” (William James description of a baby’s first experience of the world). Undifferentiated life is a complex place. Stamp collections are not. Just to keep fueling your experience and naming of what is naming…. A) The first does it by making a deep connection between the sociology of naming and the nature of a community in a fictional world. “Anyhow, the people of the Valley had no objection to long names. They liked them. Perhaps they enjoyed the fact that they had plenty of time to say them. They were not ashamed of having time. They lacked drive, that great urge to get done which powers us, sending us forward, ever forward ever faster, reducing San Francisco of the slow settlers to Frisco and Chicago of the even slower natives to Chi and the town of the mission of our lady of the angels becomes Los Angeles, but that takes to long so it becomes L.A., but jets go faster than we do so we use their language and call it LAX, because what we want is to move on quick, to go fast, get through, be done, done with everything. To get it over with, that’s what we want. But the people who lived in the Valley and gave interminable names to their houses were in no hurry.